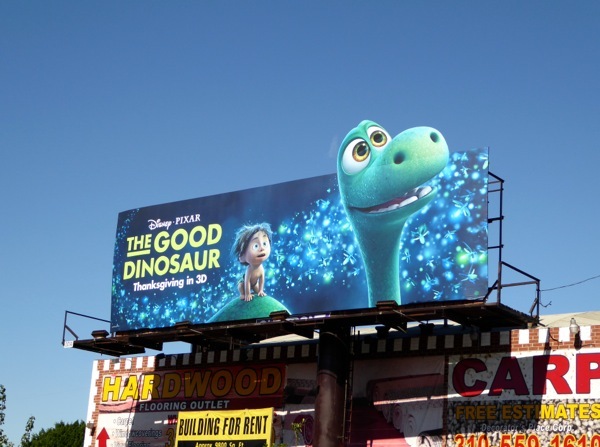 Recently The Peanuts Movie showed the endearing friendship between one boy and his dog in its outdoor ads, and now The Good Dinosaur brings the feels with one prehistoric dinosaur and his caveboy to the city skies. 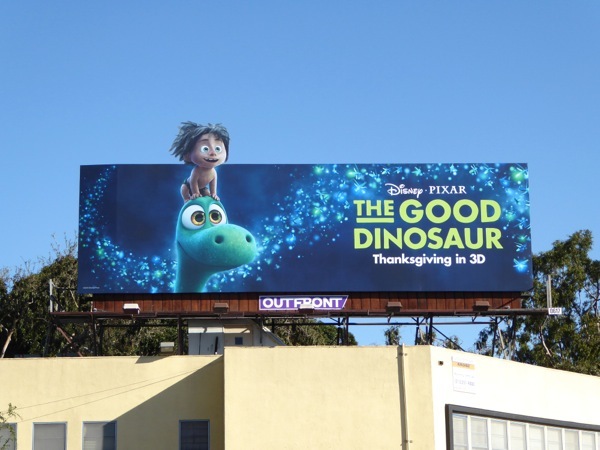 Disney/Pixar are certainly bringing the 'awww' factor to the L.A. skyline this month to help get you in the festive holiday spirit before the film's Thanksgiving theatrical release date. 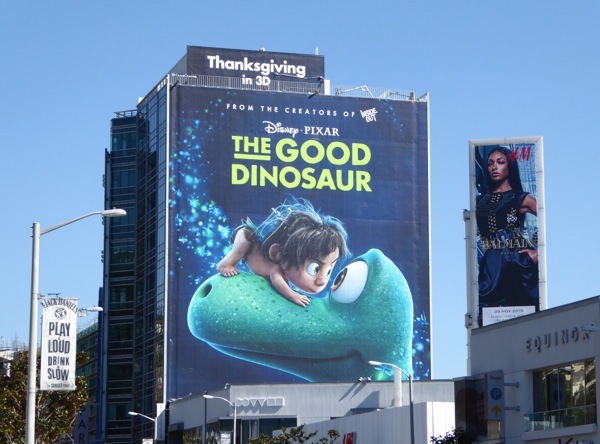 Once again it looks like the studio will deliver a magical tale in the same vein as previous box office-winning stories like Toy Story, WALL-E, UP, Finding Nemo, Cars, The Incredibles and more besides. 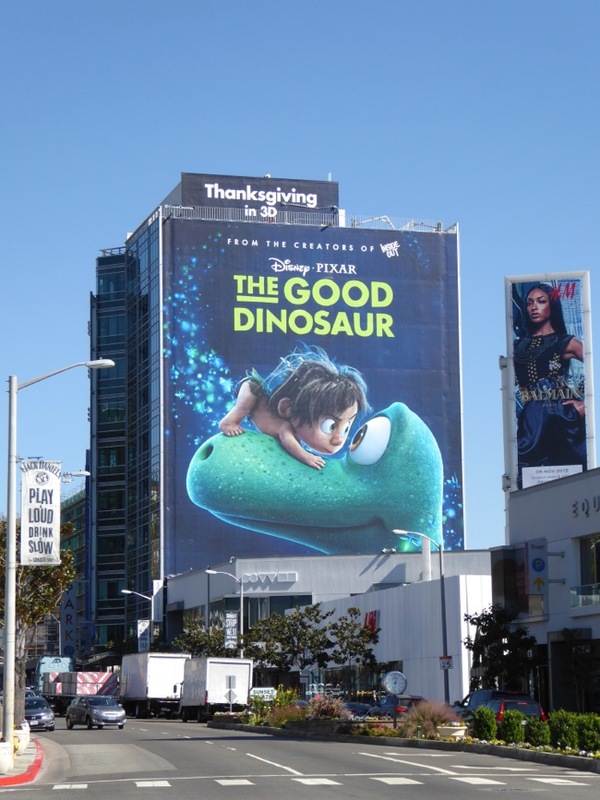 In this computer-animated movie the premise is set in a fun alternate version of prehistoric Earth, in a timeline where the asteroid that caused the extinction of the dinosaurs never hit the planet. 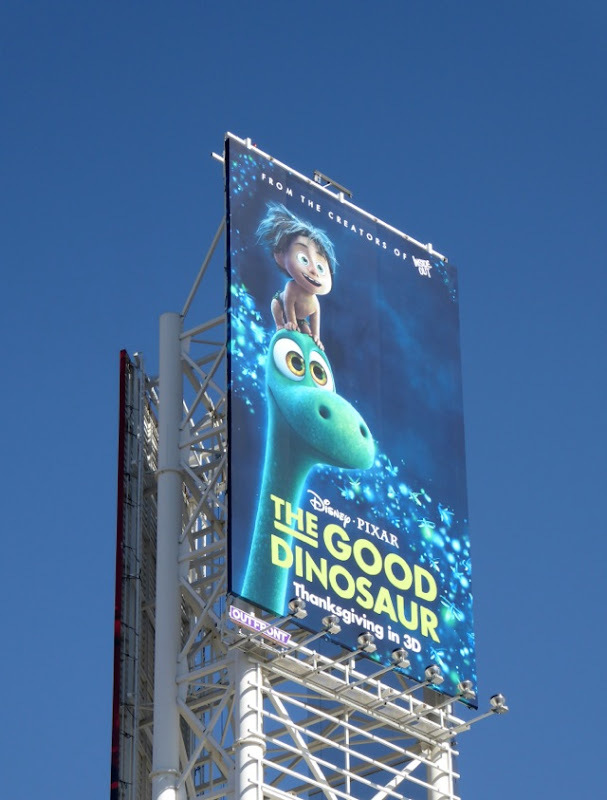 'Arlo' is the young Apatosaurus who loses his father in a tragic accident and finds himself far from home when swept away in a river. 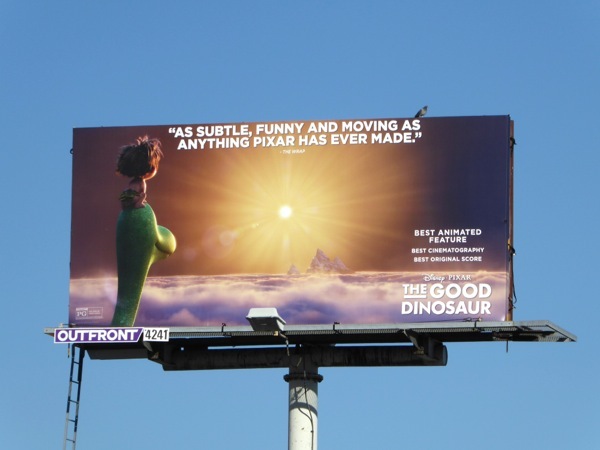 On his epic journey back to the Clawed-Tooth Mountains he befriends a human caveboy that he names 'Spot'. 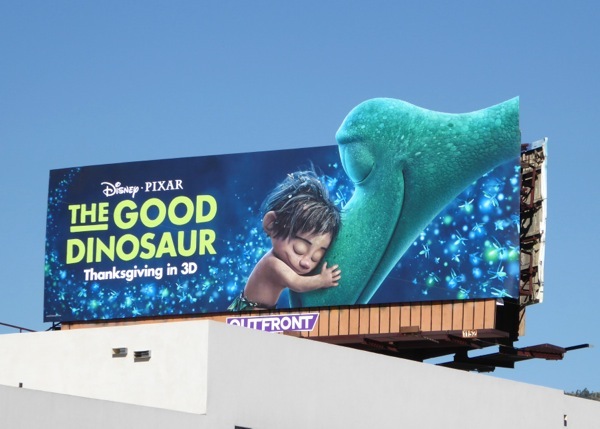 From the looks of things they become great pals. 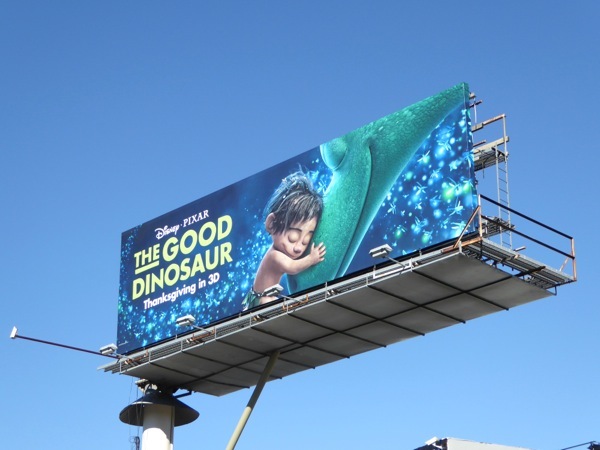 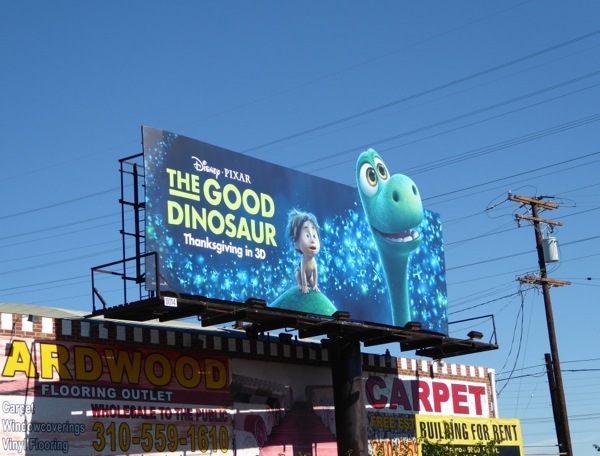 These heartwarming special extension and standard billboards for The Good Dinosaur were spotted around the streets of L.A., from La Brea Avenue to La Cienega Boulevard, Melrose Avenue to Highland Avenue and high above Vine Street in Hollywood from October 26 to November 6, 2015. 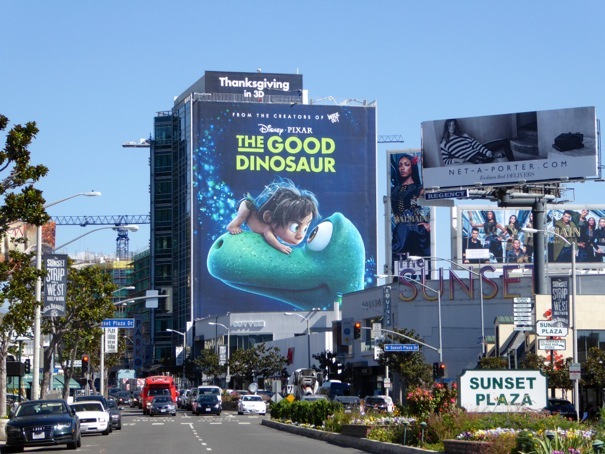 Meanwhile the giant-sized billboard making a big spectacle along West Hollywood's Sunset Strip was photographed on October 29, 2015. 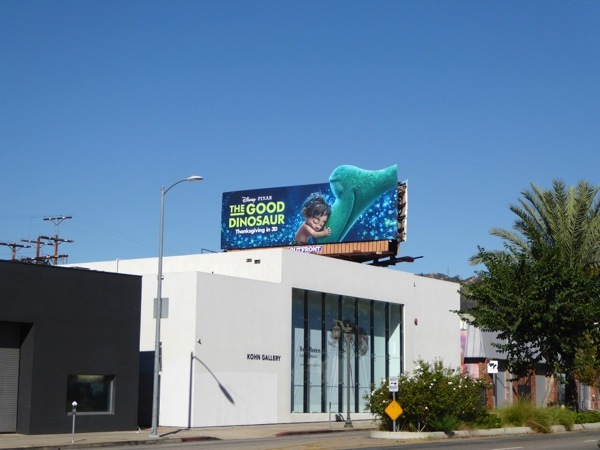 If you're a fan of Disney/Pixar's other animated films, be sure to also enjoy these Brave movie billboards, this giant Finding Nemo billboard, these joyful Inside Out movie billboards, these fun Monsters University movie billboards and many more examples here at Daily Billboard. 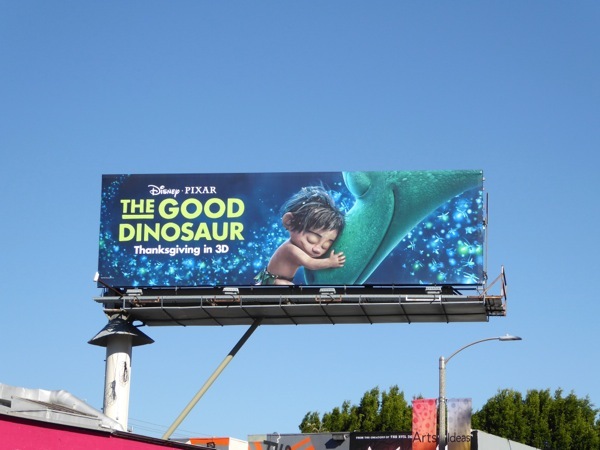 This year Disney/Pixar has given us the gift of two animated movies, let's see if The Good Dinosaur can pull heartstrings in the same way Inside Out did earlier this Summer. 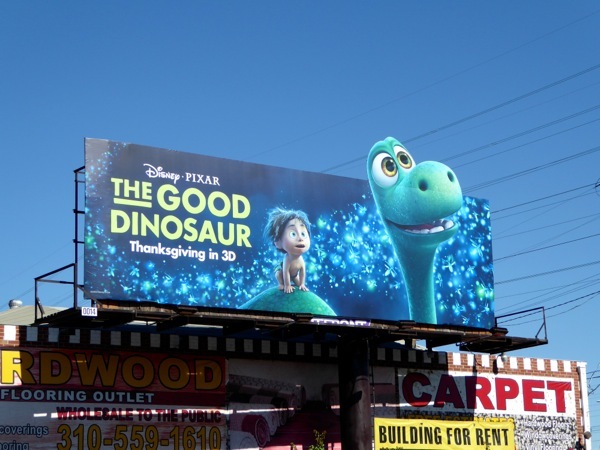 UPDATED: It's that time of year in Hollywoodland when everyone starts their campaigning for awards season. 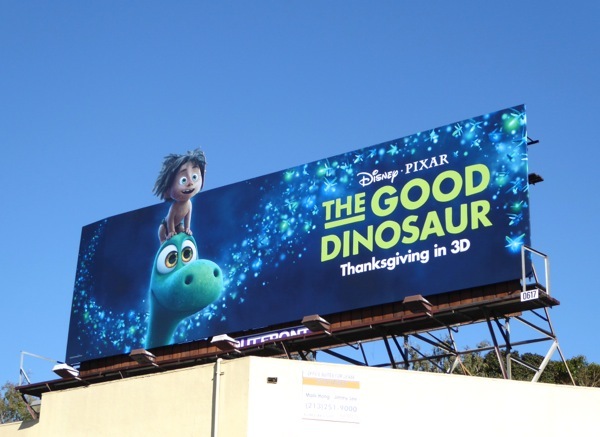 With The Good Dinosaur already nominated for the Golden Globe for Best Animated Film (alongside fellow Disney/Pixar movie Inside Out), it's time to try and get voter's attention and get on Academy Award members radars too with this consideration billboard snapped along Highland Avenue on December 16, 2015.